The week before last was New York Fashion Week and design group The Blonds created a line inspired by Disney villains and it is amazing! In my fashion design class we studied the collection and I'm sharing five of my favorite looks from the NYFW collection. YouTube personality Patrick Starr walked the runway in this amazing Ursula-inspired look and I love it! The amount of detail put into this look is amazing. 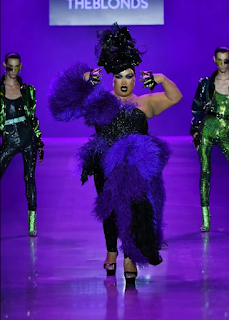 From the purple fur made to look like her tentacles to the finger pieces, I'm definitely feeling the Ursula vibes! Not to mention the gorgeous strapless sparkly jumpsuit! This Cruella De Vil inspired look is so fab! The Curella looks from this collection have to be my favorite of all of the villains featured. I love that the whole dress/bodysuit is Cruella's head and the red thigh high boots finish off this look. This look definitely screams the Evil Queen! I love the mosaic gold and silver and I love the over the top coat that has a knife and heart mosaic on the back. I love this Ursula look! The concert inspired tee and fun fur pants are my favorite. I have always loved furry legwarmers so I will be on the hunt for these purple and black leg warmers this winter! And can we talk about the sea animal necklace--AMAZING! This Evil Queen look is so fun! In the video from the fashion show you can see that the model has waist length hair that moves when she walks and I definitely think it adds to the look of this studded outfit. All photos used from wwd.com and can be found at this link: Disney Villains x The Blonds. I do not own any of these photos.